Batterie parfaitement fonctionnelle dès le déballage. Excellent product and competitive pricing. Excellent!! I could not find a battery on line that actually came complete with acid or electrolyte thanks to new postage rules. This gel battery cost less than the majority of acid filled ones & is immune from postal rules. It came extremely well packaged so that even the most determined idiot would have a hard time damaging it. Honestly I think you could drop kick the box down a large fight of stairs & it would survive unharmed. Amazing to find a company who not only recognise the problems tha arise from sending items via couriers but have actually addressed and solved them. Seriously impressive. The battery arrived on time and was well packaged, simple to install. Correct fit, no charge ready to use battery with quick delivery. Good value and good sevice, fitted to my 2017 Royal Enfield electic start. The battery arrived very promptly ~ great service! After a couple of hours on the Optimiser,rather than just fit it right away,I fitted it easily and the bike fired up immediately. This improved performance has continued since. Very happy with the product. Good product very reasonably priced. Quick delivery, excellent service. Commande expédiée rapidement. Colis reçu nickel. Batterie mise en charge avant utilisation. Branchement, contact et vroum, bonne patate. Pour linstant ruen a redire. 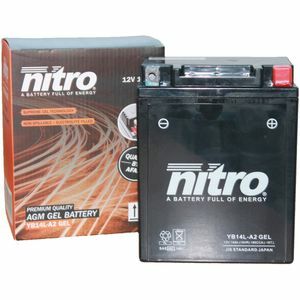 I purchased a YB14L-A2 GEL Nitro Motorcycle Battery for my 500 cc efi Royal Enfield. This battery is a direct replacement for my existing battery. (same size,battery connection and shape as my original battery). It arrived very quickly and was fully charged so was an easy task to undertake. Very pleased with your product.